Welcome to PERIL Universe Forum! We are a small, but growing community for sci-fi, fantasy, and horror fans. Our goal is to provide an entertaining environment for fans worldwide. We should have saw this trend coming when Snow White and the Huntsman made its debut in theaters. I guess the Wonderful Wizards of Hollywood decided to give the Cullen's a much needed vacation. Hey we all need to getaway from it all every now and then, but to OZ ? Is NOTHING sacred? Sarcasm aside, this may be a good thing. It's not everyday you get to see your childhood bedtime stories in HD. Even if the producers take creative license and change a few things here and there just to shake things up a bit. 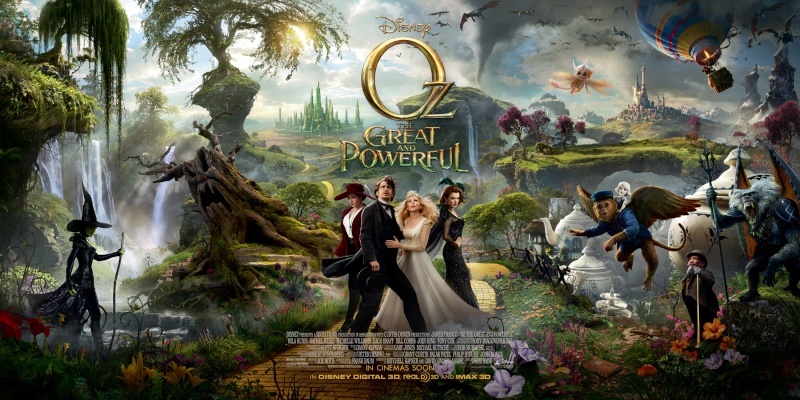 'OZ' A CREATIVE LEGAL WALTZ BETWEEN 2 POWERHOUSES...WB AND DISNEY: REVIEWS RAVES RAIMI'S FANCY FOOTWORK! After sifting through various reviews on the early showing of "Oz the Great and Powerful" I feel like I barely made it through the poppy field >light-headed!< It seems the making of this film was a creative logistical legal nightmarish dance with Sam Raimi doing a jig. However, critics applaud his stylish take on the prequel to "The Wizard of Oz". This was not an intentional prequel by any means. Apparently, Warner Brothers now owns the rights to that 1939 MGM film "The Wizard of OZ" and they are known to aggressively police their copyrights. “The MGM film presented the story in a certain way, and it’s those things — the embellishments, the creative decisions — that Disney cannot use,” explained Bonnie Eskenazi, a leading copyright lawyer with no ties to “Oz the Great and Powerful” who has successfully battled studios on behalf of theJ. R. R. Tolkien estate ." -- NYtimes.com. Disney concerned with copyright, the Yellow Brick Road will not be spiraling into a stylized point smack in the middle of Muchkinland. Said territory was a creation of the 1939 film. Raimi added his own take on the road: the mood of the road changes, in the dark forrest for instance, it's overgrown and broken. That's dark and in true Raimi style---think "Drag Me To Hell ." Berger: (ghoulish laughter) wooUUAHHHH ...(throws head back and rings fingers) Ha! Ha! Ha! Ha! HAAAA! Sorry, since this film is pre-Dorthy we won't be getting those Judy Garland-Jimmy Choo high-steppas! (Surely, a mi$$ed opportunity for brand integration). About 40 dwarfs were cast in "OZ the Great and Powerful" as the beloved munchkins (I won't even go there...can't help it, we do love our stereotypes, huh Disney? 85 years and the temptation is still strong ). The Munchkins have changed a bit "efforts were made to include African Americans and Asians...,"---hey this is a direct quote from NYtimes.com They still have strange hair, but Disney's lawyers nixed one style as too similar to the original movie. It was digitally altered in postproduction. The flying creatures are now baboons courtesy of Mr. Raimi. One of the simians, a friendly monkey in a bellhop suit serves as a side-kick in this film.